Sabrina grew up in Stirling, a small country town in Ontario Canada before moving to Australia in 2013. 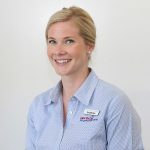 Since graduating at Charles Sturt University, she has completed additional training including Sports Trainers Level 1, M.A.T Assessment, dry needling, GLA:D Australia and DMA Clinical Pilates. Sabrina has particular interest in the adolescence sporting athlete, lower limb injuries and spinal rehabilitation. This passion has assisted her in her role as head physiotherapist for our local SEABL Commercial Club Bandits Basketball, Australians Adult Deaf Games, Beach Volleyball team and Australian School Sports Basketball Tournament for U12’s / U18’s. When she's not working out at Border Sports and Fitness Centre, you can catch Sabrina tackling an adventure whether it’s walking up Nail Can with her pup, swimming or completing mini triathlons. She is passionate about exploring different cultures and travelling around the globe.